I’m writing with an update on my ongoing conversations with student representatives of THE General Body as they enter the fourth day of their presence on the ground floor of Crouse-Hinds Hall. 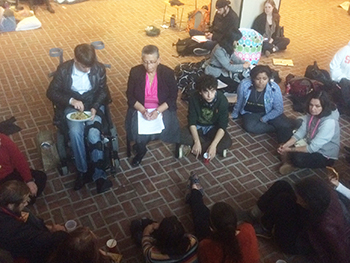 University College Dean Bea González meets with members of THE General Body in Crouse-Hinds Hall. Last night Chancellor Syverud and I met for nearly 90 minutes with 80 representatives of THE General Body and campus community to listen to their concerns and discuss a process for continued dialogue to address the issues they detailed in the 43-page document released on Monday. Immediately following the meeting, the Chancellor, his Executive Team and I got to work to specifically address some of the most immediate and deliverable responses to their demands. The Board of Trustees would delay action on the University’s Mission and Vision statements and allow for an additional campus comment period. A set of the student group representatives would have an opportunity to meet with a group of Board of Trustee members on Saturday. University leadership is willing to sign a non-retaliation/student judicial violations commitment that would cover any activity by students who participated in the sit-in. A promise to expedite a search for an Americans with Disabilities Act (ADA) coordinator and to include input from the students during the search process. A commitment by Provost Eric Spina and Senior Vice President Rebecca Reed Kantrowitz to meet with the group this afternoon for as long as necessary to go through the 43-page living document point-by-point. In making these many commitments, University leadership asked for only one thing from the student group in return—that they commit to depart Crouse-Hinds Hall by tomorrow and return the building to normal operating status moving forward. This is a building that houses classes, offices and the Admissions Office, where prospective students and parents arrive daily. In lieu of a meeting with Provost Spina and Dean Kantrowitz, and by vote of THE General Body this afternoon, the students requested the Chancellor’s Executive Team submit written responses to their Demands and Solutions. Tonight I shared our response with them. So far we haven’t been able to reach an agreement. This is disappointing given the proposals that involve the Board of Trustees are time sensitive and require action by tomorrow morning. Nevertheless, I continue to interface with the Chancellor and the students to reconcile this situation as soon as possible and remain hopeful progress can be made.